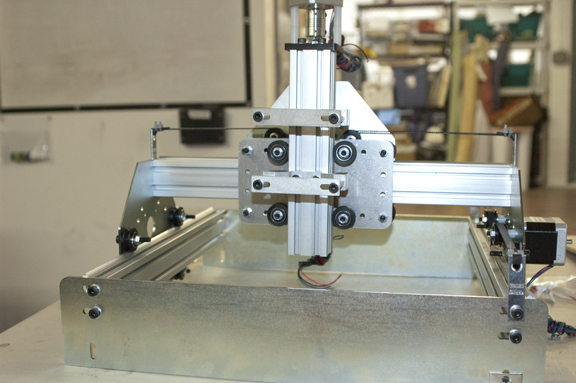 For the past few months, my CNC Build Club project has been building a <a href=”http://www.shapeoko.com/”>ShapeOko CNC mill</a> from a kit Jeff donated to PS:One to replace the machine hacked into a pick-and-place. 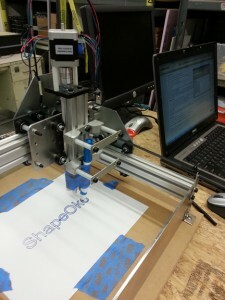 The ShapeOko belongs to PS:One and will (hopefully) be a permanent part of the space. On July 21st, I moved the machine to its home in the shop, finished wiring it up, and tested the motion of the stepper motors. 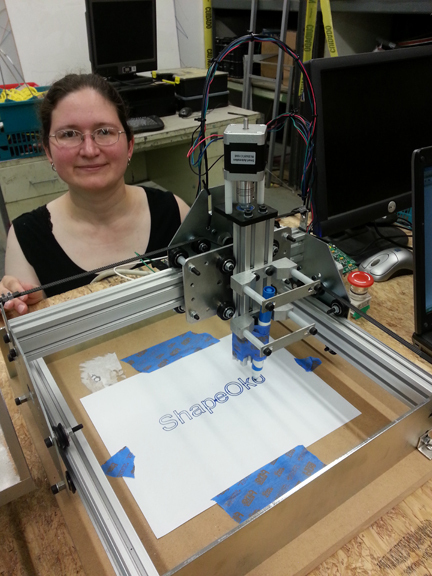 It moved like it was supposed to on the x, y, and z axes, so I moved on to drawing the Hello World job (the ShapeOko logo) in the air. That worked perfectly, too. So now it was the moment of truth – time to find a drawing implement, tape it to the gantry, and send the GCode to draw the logo on paper. A very happy me, and a successful Hello World. After tweaking and tightening up the mechanical build, I assembled all the electronics I would need, mostly from donations to the project. (Thank you!) 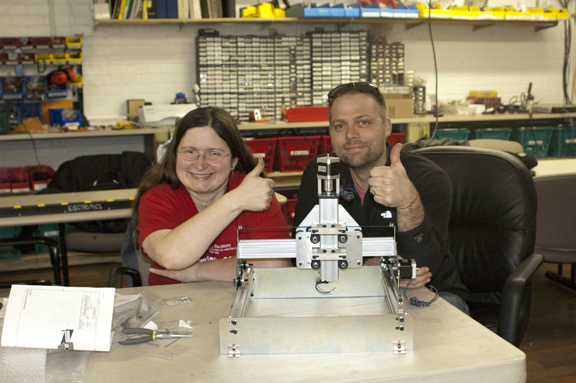 Edward came back for ShapeOko night as part of CNC Build Club, and we got the machine wired up. 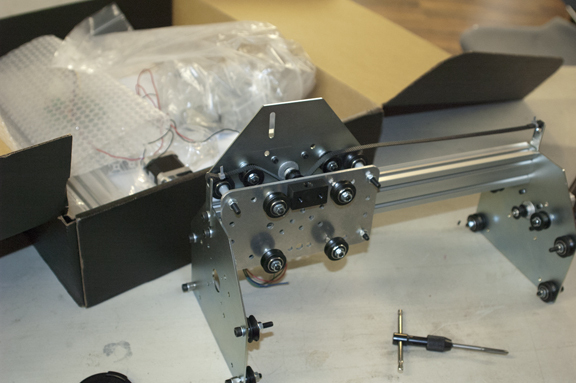 Unfortunately, the x-axis didn’t move properly, probably because the GRBLshield controller got damaged during rework. So Bart donated another GRBLshield, and Ryan did some heroic rework on its connectors, and this one worked! Colin donated a Dewalt spindle to the project, and the next step is to get some end mills, test the machine’s milling, and certify some people. I’m also looking at installing some limit switches on the machine. Of course, there are also options like a different spindle, a dual-driven y-axis, or a more robust z-axis. 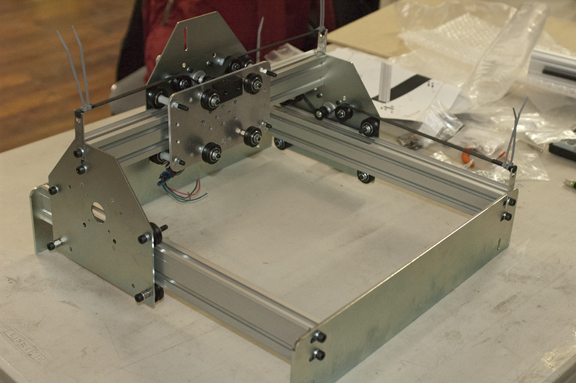 Those will be things for the CNC Build Club and other interested members to decide on. I got this far with more than “a little help from my friends”. Thank you to the people who offered help, parts, or advice (in no particular order): Jeff, Jay, Steve, Colin, Ryan, Edward, Cat, Bart, Jeremy, Fernando, Jesse, and Everett. If I accidentally left you out, I’m sorry! Looks Great, Elizabeth. I really admire your perseverance and the effort you put in to learning all the skills you needed along the way.